Don't call them Zucchini fries. There is nothing heavy about these light and crispy zucchini straws. They are so thin and delicate that they simply melt in your mouth. They are best served hot out of the fryer and topped with a sweet and tangy balsamic glaze. They will disappear off the table faster than you can fry the next batch. 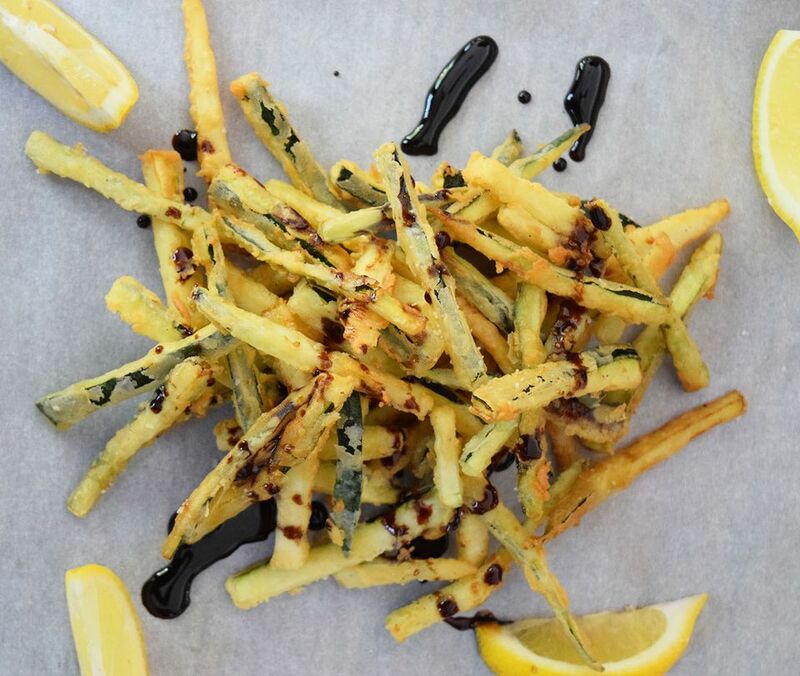 Sometimes you can find these delectable fried zucchini treats in an Italian restaurant, but they are so easy to make at home. There are very minimal ingredients and you can fry them in any heavy-bottomed pot that you own. Heat the sugar and balsamic vinegar in a small saucepan on low heat, until it is thickened and the liquid is reduced, about 5-10 minutes. Slice the zucchini into 3-4 strips. Slice those strips into the smallest thinnest strips you can manage, discarding the innermost, seedy strips (these will be too soggy to fry). Combine the flour with some salt and pepper (about a teaspoon of each). Combine the milk with some salt and pepper as well. Heat the oil in a heavy-bottomed pan on medium high heat (about 375 F). In batches, dip the zucchini strips in the milk and then in the flour mixture. Drop the zucchini strips carefully into the hot oil. Fry in small batches until golden brown, remove and then place on a paper towel lined plate. Keep warm in the oven (200 F). Repeat with remaining zucchini strips. Drizzle the finished zucchini strips with the glaze and serve immediately. These are not good left over.